Just popping in purely to post these images so that I can then upload them onto pinterest, which I love as an organisational tool. Am very happy creating mood boards for every room of the house. Can't actually act on any of these redecorating/renovation ideas but virtual planning is almost - if not more - fun as budget is irrelevant. More of a big things, unaffordable pleasures post. Both these images are from Inside Out's 2012 Renovating and Decorating guide, but don't appear on its website, hence my scanning. 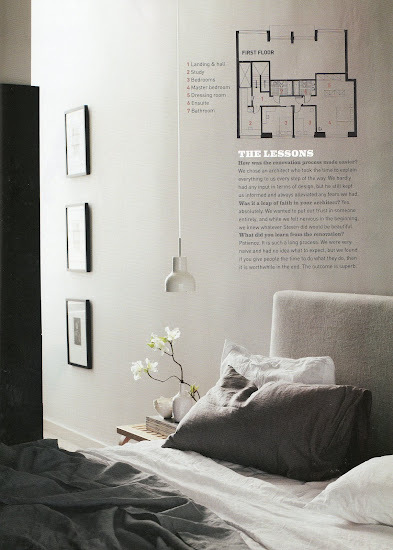 For the record, the bedroom image (it's the bed I'm interested in - Jardan's Leila bed) is from Julian and Louise Thompson's apartment in St Kilda (photography Sharyn Cairns). The bedlinen, which I also love, is from the architect's (Steven Whiting) wife's online shop y10store.com. 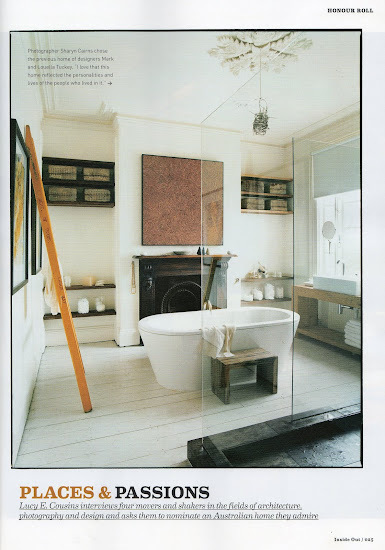 Bathroom image is an old one that's got another run, as photographer Sharyn Cairns nominated it as coming from one of her all-time favourite houses (it's in Melbourne and used to belong to Mark and Louella Tuckey, who've since moved to Sydney). Record straight. Images loaded. Off to pinterest. Bathroom is rather modern and creative. The bath standing in the middle of the room may cause the unexpected damages to the whole house. The glassy door doesn't seem to be well seen. Someone may get hurt by it.